Stanley Kubrick gave us a lot of mad men; from the bomb surfing Major King Kong, the teenage sociopath Alex deLarge and through to the axe-swinging hotel custodian Jack Torrance. 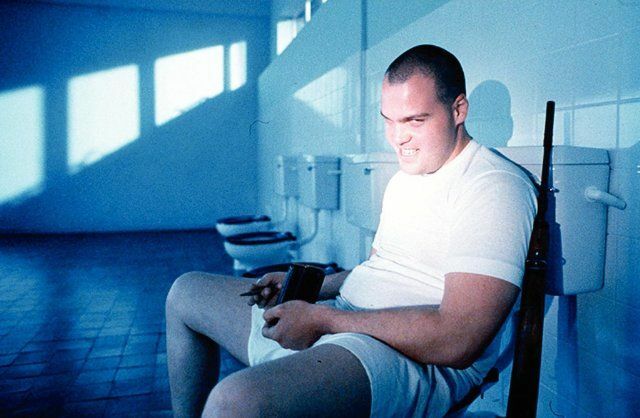 In 1987 Kubrick presented the Vietnam War drama, Full Metal Jacket and with it, a gallery of men whose mental state was less than healthy. Of them all, Vincent D’Onofrio’s Private Pyle is perhaps the most sympathetic. In this scene, after weeks of torment and torture at the hands and mouth of Lee Ermey’s brutally unhinged Gunner Sergeant Hartman, Pyle is discovered in the bathroom by Joker (Matthew Modine) on his late night patrol of the barracks. Kubrick’s trademark symmetrical shots and single point perspective are illuminated by the sweeping beam of Joker’s torch as he quietly makes his rounds. As he enters the bathroom, he is greeted by a clearly disturbed Pyle. “Hi Joker,” he hisses. Joker is clearly terrified as he asks Pyle about the weapon leaning against the wall and the ammunition being loaded into the magazine. He chillingly confirms the contents. “Seven, six, two, millimetre, full metal jacket,” he states, as he clicks each bullet into place. Pyle stands to attention and begins to bellow out his rifle drill, the sound bouncing of the cold white tiles and echoing around the halls. Gunner Sergeant Hartman is woken and bursts into the bathroom, unleashing a torrent of angry questions at the two men, both fixed to their spots on the ground. Pyle levels the rifle at the sergeant’s chest and shoots him straight in the heart. Joker stares at the prone body, speechless at first, but then finds his voice. Graham Woods is a person of average height, with a beard, a family, a dog and a cat that hates him. He is the presenter and co-creator of YouTube movie show "Jaws 19"
Hi. I see that you don’t update your blog too often. I know that writing articles is time consuming and boring.